★This 3.7V 800mAh LiPO battery is a Capacity upgrade battery.It's a perfect choice for a replacement battery. ★It will give more PUNCH and ROBUST performance due to its higher current output and power. ☞This 3.7V 800mAh LiPO battery is a replacement battery. ❤[Capacity upgrade]ENGPOW 3.7v 800mah upgrade battery, large capacity, longer flight time, more power! 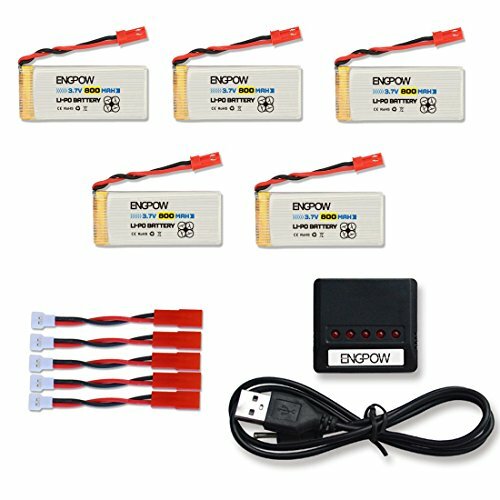 5pcs battery for your rc drone to give enough energy, and your friends enjoy your happiness with rc drone! ❤[Compatible models]Direct replacement battery for Holy Stone F181 F181C F181W Potensic F181DH Force1 F111 Phoenix JXD 509g RC Drone, no modification is needed. ❤[Battery Material] ENGPOW lithium batteries using 100% pure cobalt raw materials, longer life than ordinary lead acid on the market! ❤[Package]5pcs batteries, 1set 5-port charger, 5pcs adapter cables,charging 5pcs batteries at one time, plug and charger fully consistent, easy to operate. ❤[service]We provide friendly after-sale service and no risk refund for our customers.100% Money Back Guarantee - Not happy? No problem.Contact us,we will full refund.